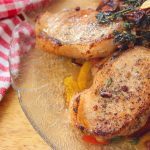 Gordon Ramsay's Pork Chops with Sweet and Sour Peppers - Headbanger's Kitchen - Keto All The Way! If it isn’t obvious already, I love to eat good food and I enjoy cooking good food too. Over the years many chefs have inspired me and one of those has been Gordon Ramsay. While he might be famous more for his cursing, he’s not one of the best chefs in the world for nothing. 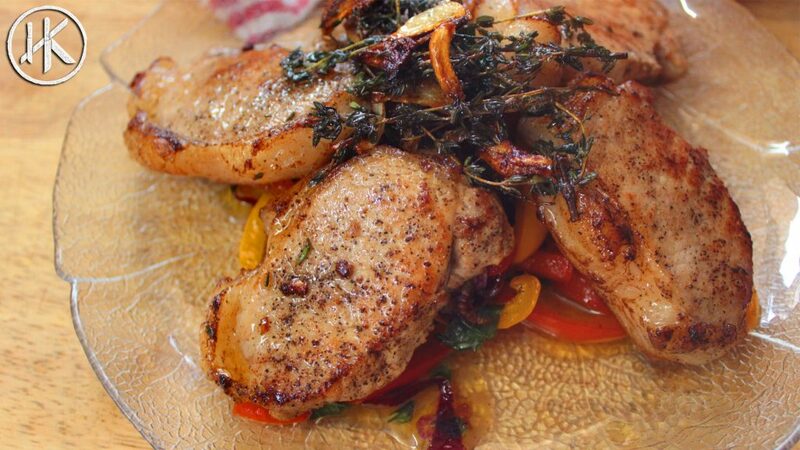 His pork chops with sweet and sour peppers is the stuff of legends. This recipe is extremely simple, it’s literally just a few ingredients of top quality, treated perfectly for maximum flavour. I hope I’ve done Gordon proud and I hope you folks enjoy this recipe. Since I didn’t get the perfect bone in pork chops, I filleted mine and cooked up just the eye or the loin part of it. I plan to use the bones to make a stock and at the end I cooked up the other meat trimmings for a tasty snack. Couple of tips to keep in mind is to cut the fat side of the pork chop with the knife so it doesn’t curl up when cooking and it cooks more evenly. Also once done cooking make sure you save the residual oil in the pan and it can be used for plenty of things in the future. Make sure you also eat that crispy garlic. Anyway, enjoy the recipe.